The Hole in the Wall kayak club rendezvoused at Tugboat Park, Anacortes, WA. Burrows Island is in the background. 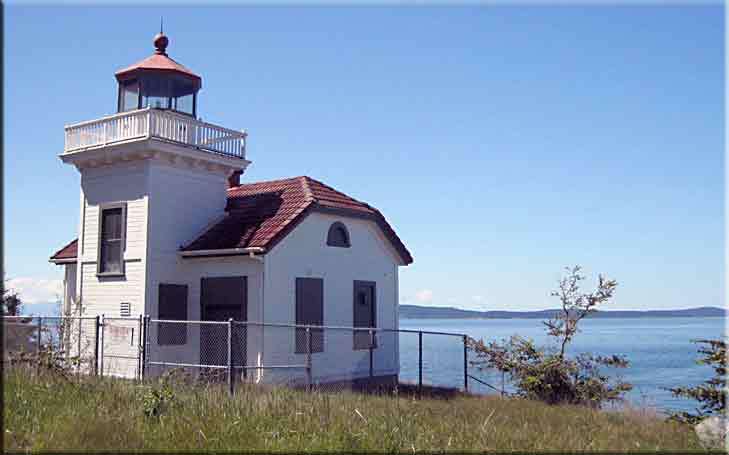 We paddled around Burrows Island to the southwest side and beached at Burrows Light. the Straight of Juan de Fucca and and Rosario Straight. The Olympic Mountains are in the background. 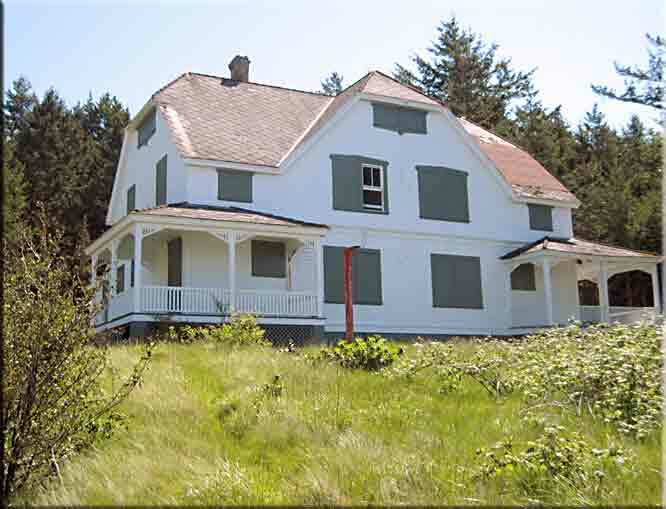 The light keeper's house sits abandoned. 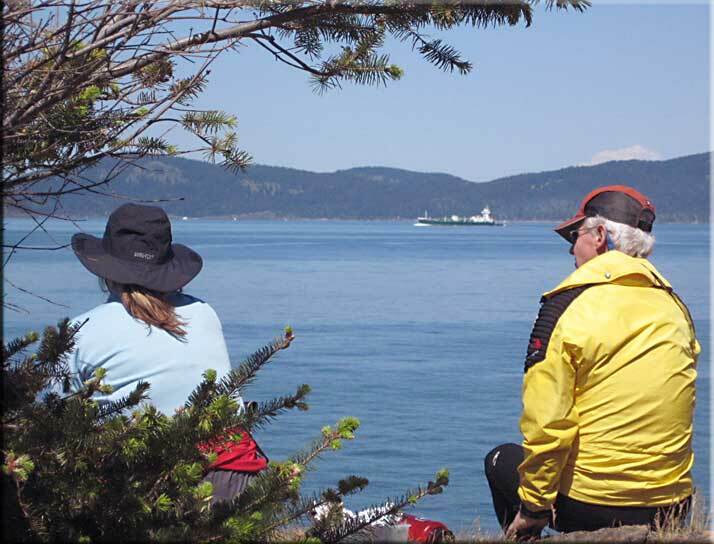 On a beautiful Saturday in May, I joined the Hole in the Wall Club, of which I am a member, for an outing around Burrows and Allan Islands, which sit just below the Skyline community in Anacortes, WA. It was a recreational trip, but we planned a bit of upkeep on the Alice Bight campground, located on the eastern side of Burrows Island. 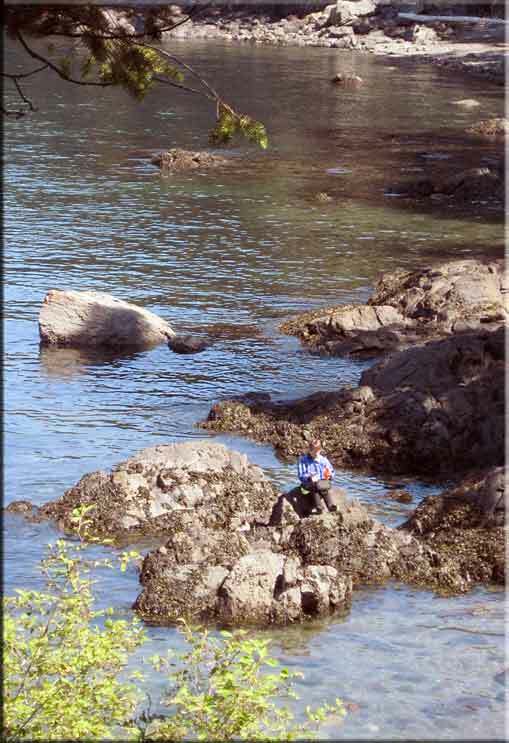 Alice Bight is one of a group of campgrounds which form the Cascadia Marine Trail. Twenty-four of us showed up, a larger group than we often have on our frequent outings. After a safety briefing by Ron Oberst, we embarked on our figure eight circumnavigation of the two islands. We were just traversing the northern end of Burrows Island when we came upon a half dozen Harbor Porpoises, working Rosario Straight for fish. Fishing must have been good, as these animals let us pass within 50 yards of them without being interrupted. Lunch at Burrows Light was so pleasant that we had to force ourselves back into the kayaks. In the fifteen minutes that we were bobbing in our kayaks and waiting for stragglers, two adult Bald Eagles in a nearby tree, gave intermediate flying lessons to two mostly grown fledglings. The young birds would fly in 1/2 mile circles and return to their tree, all the time being encouraged by quiet but shrill whistles by the adults. We paused at the huge boat dock, owned by Paul Allen of Microsoft, on the north end of Allan Island (the island got its name before Paul Allen bought the island), then went clockwise around the island. The open water at the south end of the island gave us some chop to contend with, but our group handled it without problem. 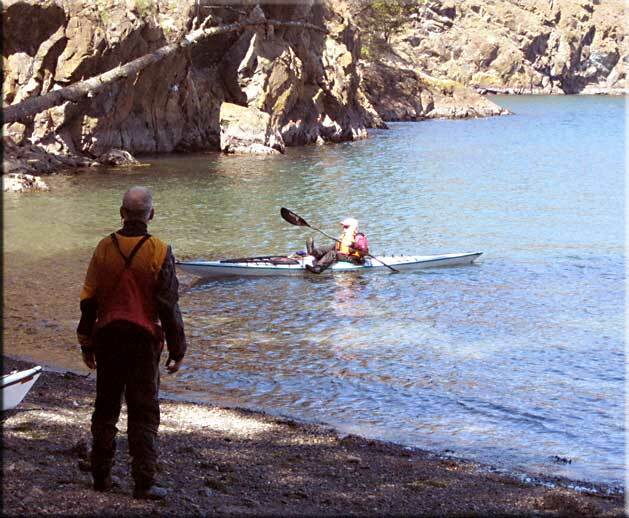 We stopped for about half and hour at Alice Bight and went through a checklist to make sure that the convenience and safety items of the campground were intact. 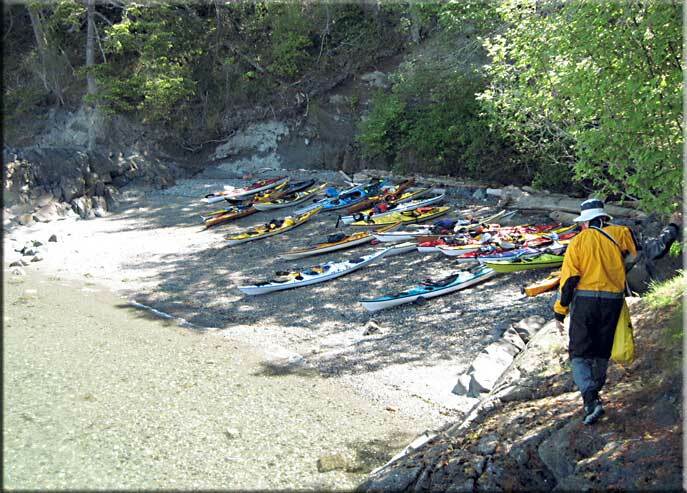 It was then a short, fifteen minute paddle back to Tugboat Park, at the Skyline community. A nice place for lunch. Yet another nice place for lunch. Looking across Rosario Straight at Lopez Island. 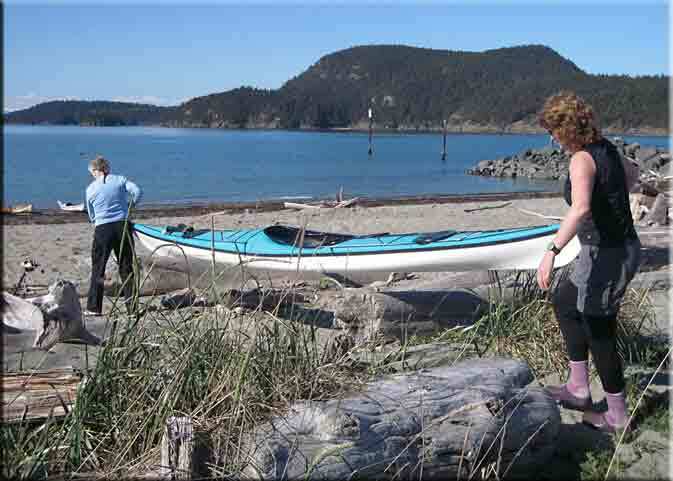 Disembarking at Alice Bight, a campground on the east side of Burrows Island.